wild turkeys, coyotes, bears, snakes, bobcats, and mountain lions." Gee, honey, let's feed the snakes and bears so they'll keep coming to our campsite . . . 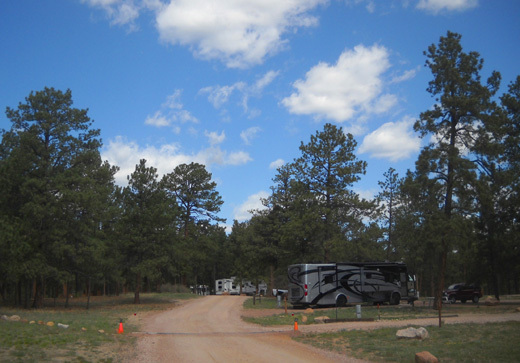 Here we are back at one of our very favorite campgrounds; it's located on the beautiful grounds of the USAF Academy in Colorado Springs. We were here twice last summer and loved it. The Academy makes a very pleasant stopping place for a few days on our way to the Black Hills of South Dakota and the Bighorn Mountains of Wyoming. We'll be back for two weeks or more in July for more of a "destination" visit, and perhaps again in September/October. Too bad we can't spend all summer here! 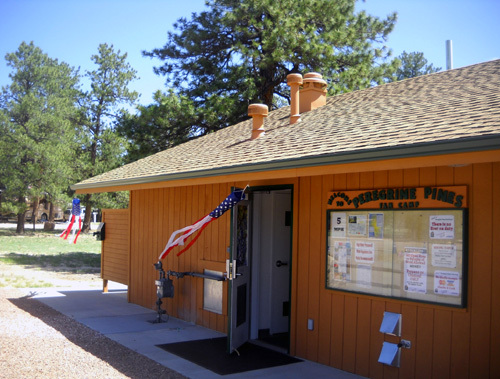 Military retirees are permitted to stay at Peregrine Pines for only 30 days total during the warmer months from May to September. The rest of the year we can stay as long as we wish. I don't believe there are any time restrictions on active-duty families. The campground is decorated with flags for Memorial Day. So what critter lives in the cage they are cleaning, we asked? I prefer mice, gerbils, and guinea pigs -- I've had those before. 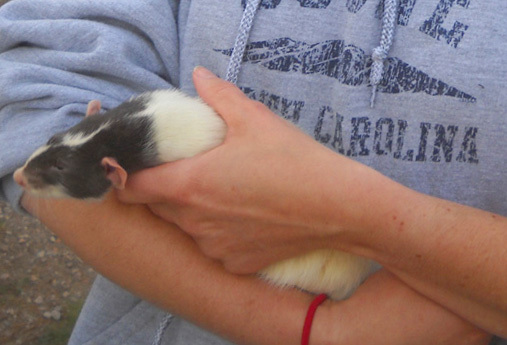 Rats just aren't as cuddly-looking. If not, do an internet search for a better photo. 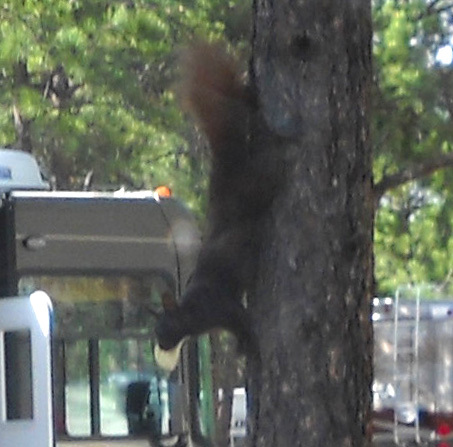 Abert squirrels are very interesting and they're fun to watch in the campground. 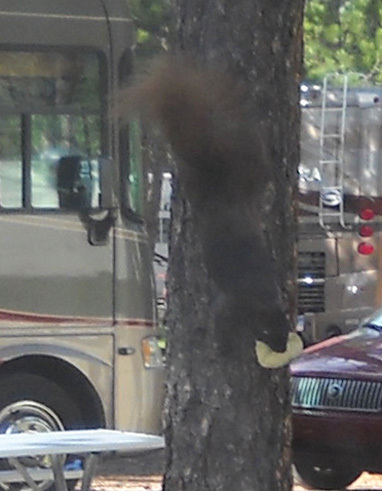 This guy looks like he found a Pringle chip -- not the best squirrel food. When Jim checked us in at the office he heard about the bear that recently trashed one of the campsites, so everyone is on extra notice to keep trash and coolers inside. The large trash bins throughout the campground have special bear-proof mechanisms on them that make it difficult for arthritic folks like me to get into them, too! I've seen deer and coyotes in the wooded areas along the Falcon Trail on Academy grounds, but no snakes, wild turkeys, bobcats, or mountain lions. I hope I see and/or hear coyotes again this visit. 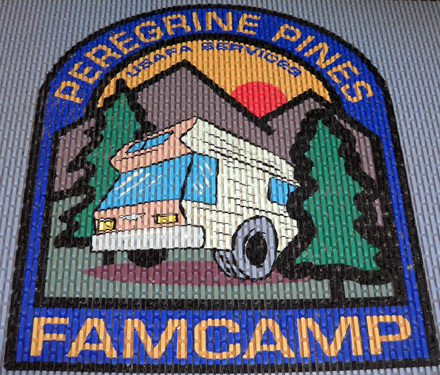 We've never had a choice of which particular site we are assigned at Peregrine Pines but we are asked certain questions when we make our reservation -- length of camper, whether we need 30-amp or 50-amp electrical service, if we have a satellite dish, etc. We've learned to also specify if we want a pull-through site, if we want as far away from the train tracks as possible, and if we want to be near one of the laundry rooms. Being close to the WiFi tower is moot this year; they added a second one since our last visit. Now we're able to get online fast and free in any site. We'll use our personal MiFi card only for secure financial business. but it's a large pull-through site with no one on this side of us. 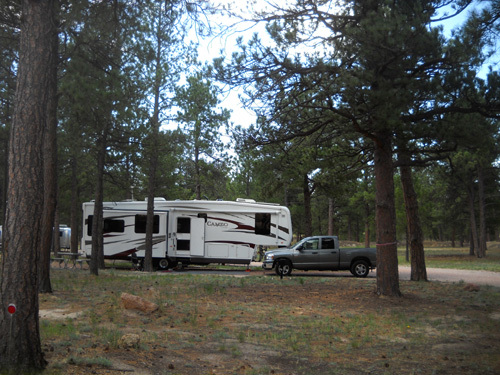 We have a good cell phone connection, lots of TV stations with only our RV antenna, a pull-through site with lots of room on the door side, full hookups with 50-amp electrical service, shade, nearby trails, lots of conveniences . . . and all for only $20/night. So we paid only $60 for four nights of camping here. That comes to a mere $15/night. 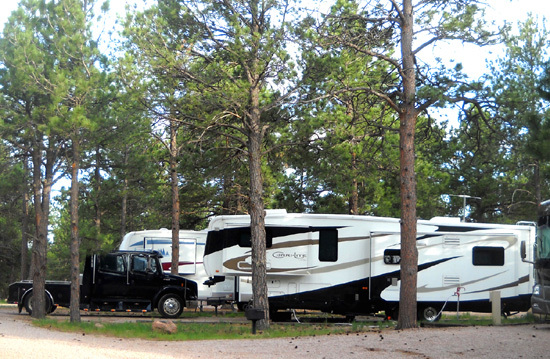 Compare that to many private campgrounds that charge $40, $45, or more per night nowadays. I'm glad military folks get some consideration for their service to our country. We sometimes see larger trucks like F-550s and semis hauling long fivers or trailers with three axels. We always wonder if they bought the monster trucks specifically to haul the RV or if they use them for business purposes, too. There is another nearby rig that intrigues us; the couple's set-up is a doozy. 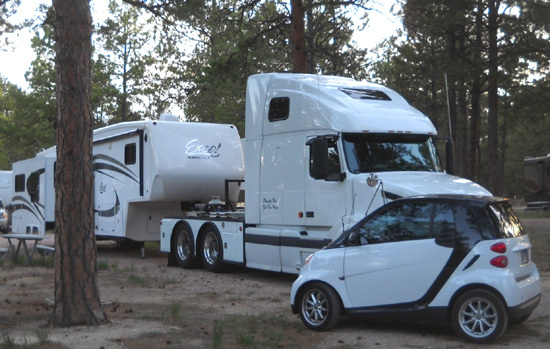 They're pulling a 38-foot Excel 5th-wheel with a large truck that has enough room between it and the trailer to carry a little bitty Smart car, too! We haven't seen this combo coming or going, but there are ramps to drive the car up on the bed of the truck so it doesn't have to be towed behind the trailer. Sure would like to see that in transit! Since the couple has SD tags, they're probably full-timers. I hope we get a chance to talk with them this weekend. 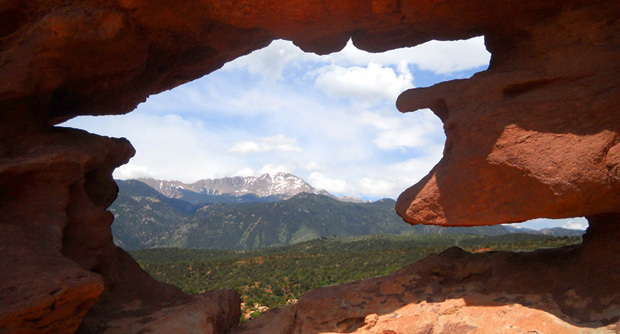 We have three full days to enjoy in the Colorado Springs area and we plan to stay busy running, hiking, cycling --and figuring out when we'll head to Wyoming to train for the Bighorn race. 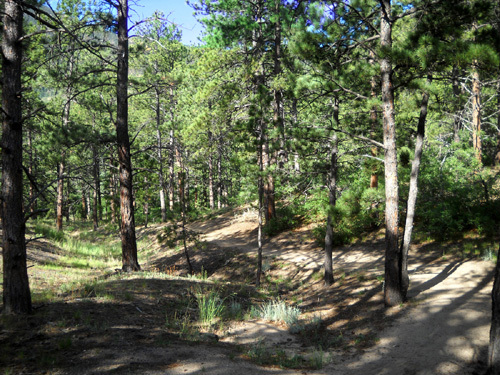 Our reservation at the Foothills Campground is for June 6-20. The snow pack is so high now, however, that we won't be able to get on much of the course before the race. We're also concerned about all the flooding in the area, especially at Foothills -- it's right next to the Tongue River. We may stay at the Academy and/or the Black Hills longer than originally planned, and spend only a week in the Bighorns. I don't know yet how far down the snow level is, but it looks like there's too much snow above tree line to get up there. Stay tuned for photos from that hike. We got to the Academy in a little under six hours today. The weather was great, from the low 50s in Los Alamos when we left about 7 AM, to the low 70s in Colorado Springs when we arrived about 1 PM. 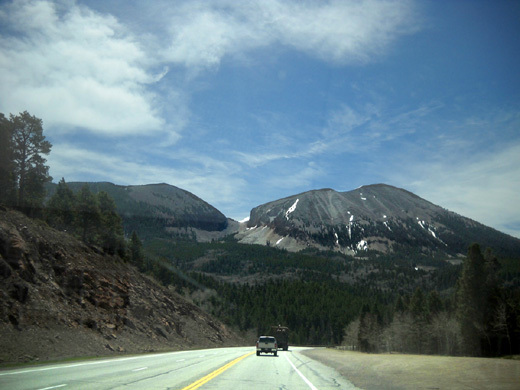 Elevations ranged from 5,700' at the low spot along NM 30 to 9,400' at La Veta Pass near Blanca Peak on US 160. We're at a little higher elevation at the USAF Academy in Colorado Springs (~ 6,700') than we were in Los Alamos (~ 6,000'). We drove this same route the same time last year and enjoyed it -- so we did it again! it doesn't look real high because the road is over 8,000 feet elev. 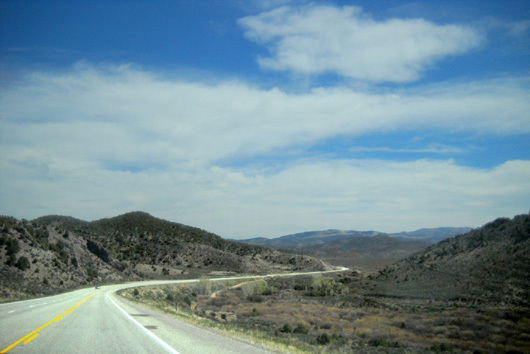 This is a good, fast route; routes for RVs don't get much better than this on two-lane roads through the mountains. 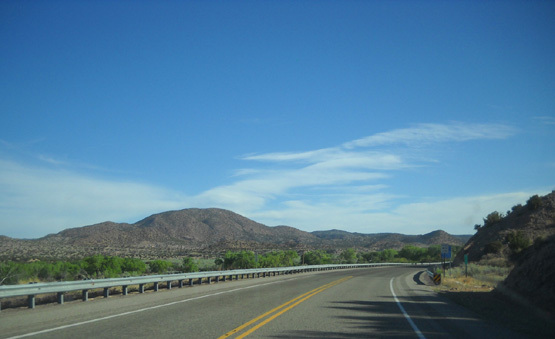 They are four-lane in some areas and there are uphill passing lanes through the hillier parts of US 160. 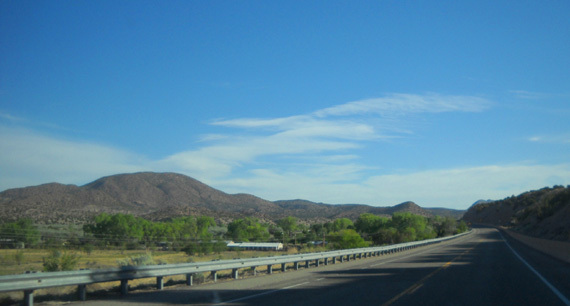 There was a lot of traffic on this weekday going the other direction toward the National Lab on NM 502 and 30 in New Mexico. 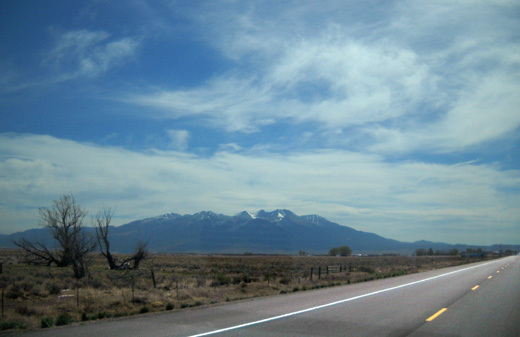 Traffic was light on US 285 all the way to Alamosa. There was lots of traffic (and many RVs) on US 160 and I-25 in both directions but it moved well. 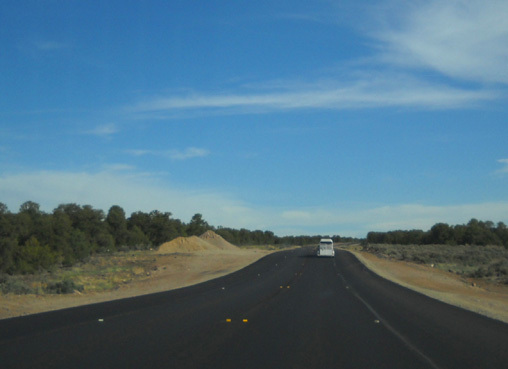 Pavement so new on US 285 in New Mexico that it hasn't been painted yet. 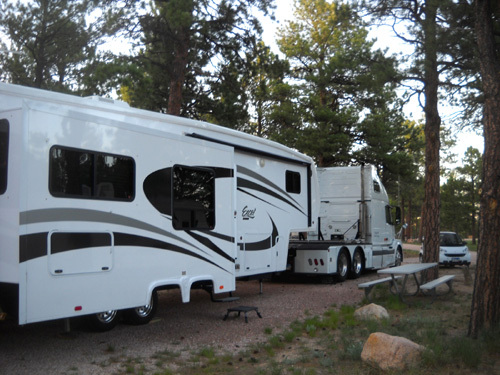 We averaged just over 12 MPG fuel usage at a fairly steady 60 MPH speed towing the 5th-wheel. The fresh, gray, and black tanks were empty in transit. 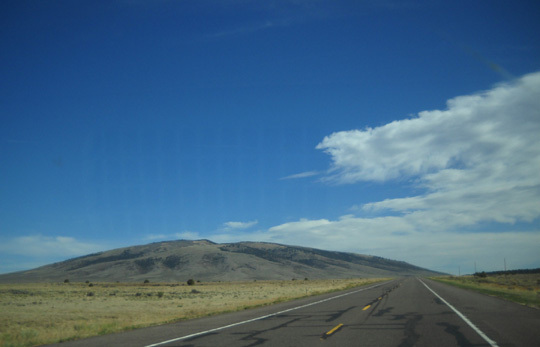 We enjoyed beautiful mountain scenery the entire way. There was some snow on the 11,000-13,000 foot peaks in the Sangre de Cristo Range in New Mexico but 'way more on the 13ers and 14ers in Colorado. 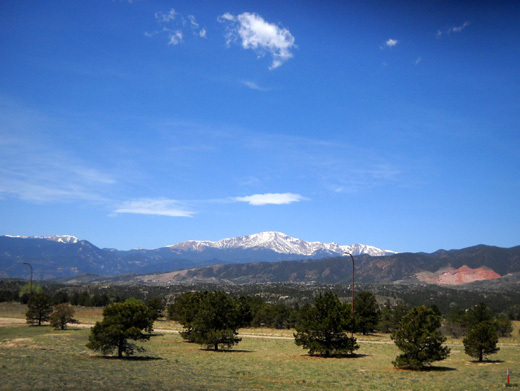 Blanca and Pikes Peak have more snow on them this year than last. 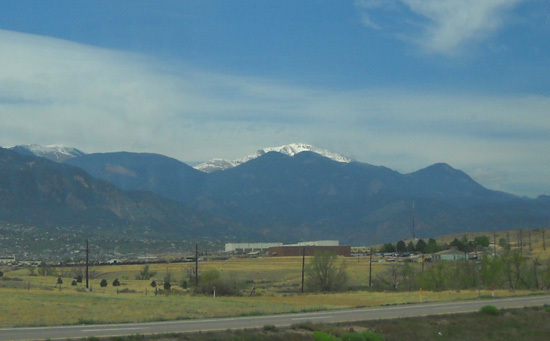 In general, the mountains in New Mexico got less snow than average this year and those in Colorado got more (the farther north, the higher the snow pack in the Rockies). Great Sand Dunes NP is between us and the mountain. We wish the campsites at the Great Sand Dunes NP east of Alamosa were larger so we could spend a couple of nights there and hike through the dunes . 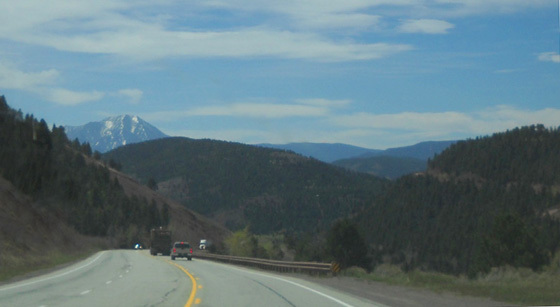 . .
We could see Pike's Peak almost as soon as we got on I-25 at Walsenburg, 100 miles away! It is easier to see from the south when it has snow on top because it is mostly hidden by lower mountains in front of it. "America's Peak" is like a beacon to me; I get a visceral reaction every time I look at it. I think it has affected many people like that, from Native Americans to modern travelers. We're happy to be back in Colorado!